Christmas for me normally kicks in around the 1st of November, but this year I’m still waiting for the feeling to hit – and we’re only two and a half weeks away! 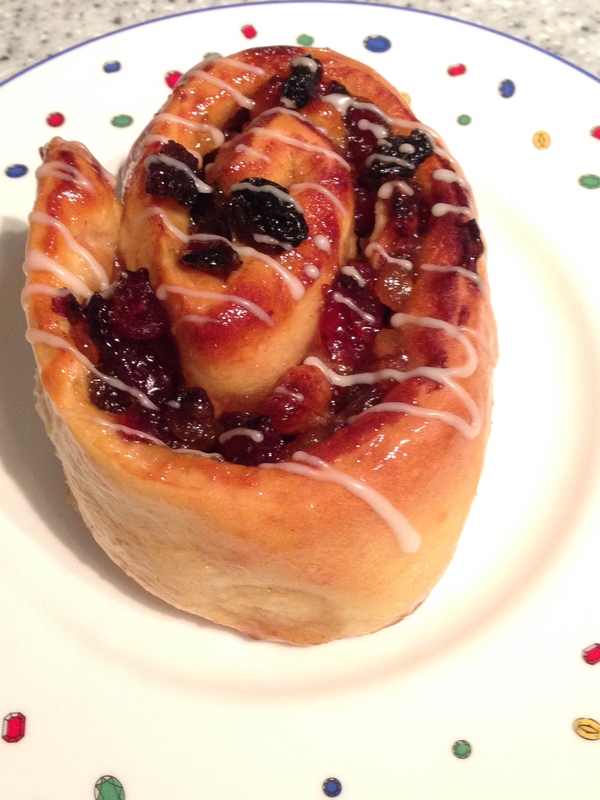 So to try and tempt the Christmas spirit, I created dairy free Christmas Chelsea Buns. 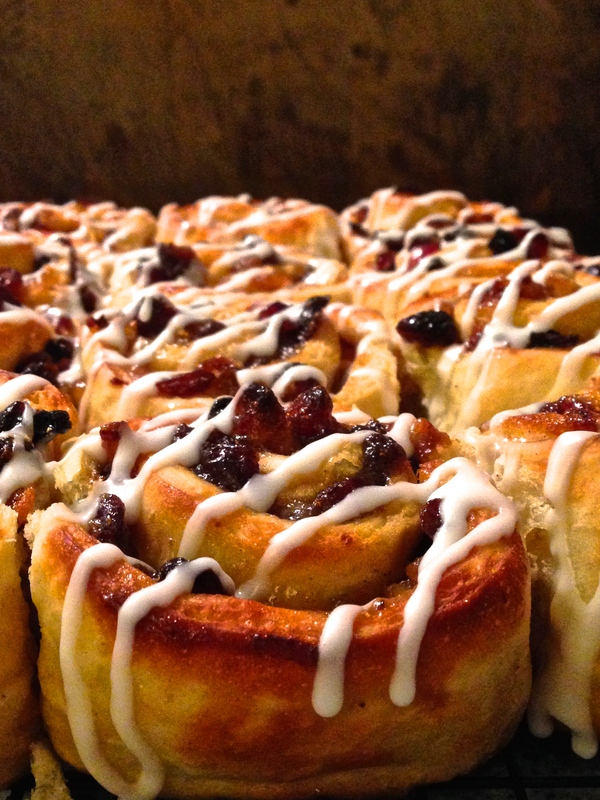 Lovely soft dough flavoured with clementines, filled with mincemeat and nuts – what’s not to like! These were not as hard as they look, especially if you have made bread before. Don’t be put off by the amount of time stated for the recipe. A lot of that time is proving and baking when you can be doing other things. I took the inspiration from Paul Hollywood’s book ‘How To Bake’. Rather than using just dried fruits as in the book, I have used ready made mincemeat for added flavour and Christmassy-ness. These make a great afternoon treat, dessert or even breakfast if you have a particularly sweet tooth! Makes 9 generously sized buns. Takes 4 hours including 1 hr 30 proving, and 25 minutes cooking. 20g dairy free butter, melted. Start by making the dough. Measure out the flour, clementine zest, salt and yeast into a large bowl, putting the salt and yeast at opposite sides of the bowl. Melt the butter and then add the milk and beaten egg. Pour the liquid mixture into the flour and stir together with your hands until the dough comes together. Tip the dough out onto a lightly floured surface and knead for 5-10 minutes until you have a soft, smooth and elastic dough. Place the dough into a lightly oiled bowl (I always use the bowl I mixed the dough in) and cover with clingfilm. Leave until doubled in size – about 1 hour but it is fine to leave it for 2 or 3 hours. Line a high sided baking tray with baking paper. Tip the dough out onto a lightly floured work surface being careful not to knock out the air. Pull the dough into a rough rectangle and then roll out to about 5mm thick. Turn the dough with one of the long sides in front of you. Tack this edge of the dough to the work surface to give you tension when you roll it. 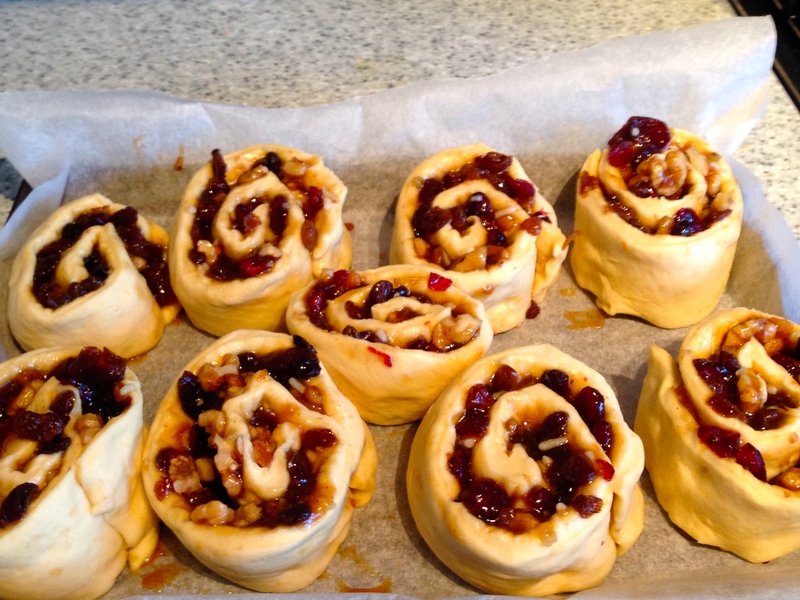 Brush the melted butter over the surface of the dough, and then evenly spread the mincemeat. 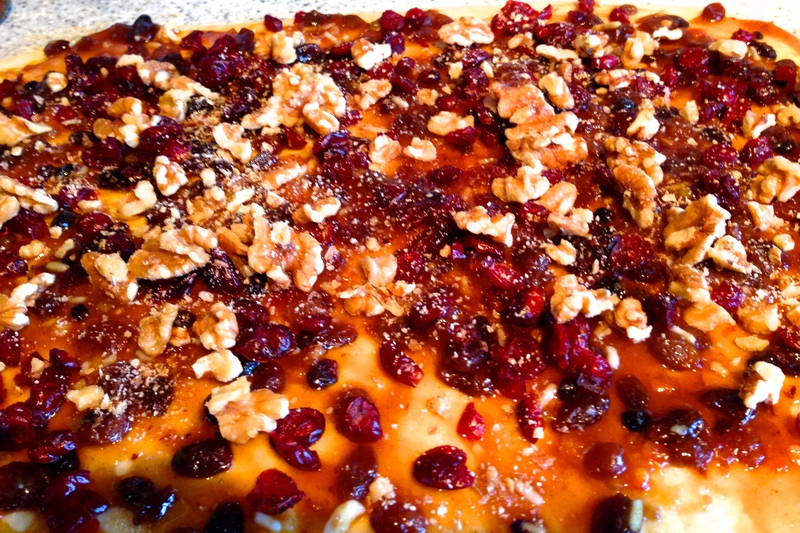 Scatter over the cranberries and walnuts. 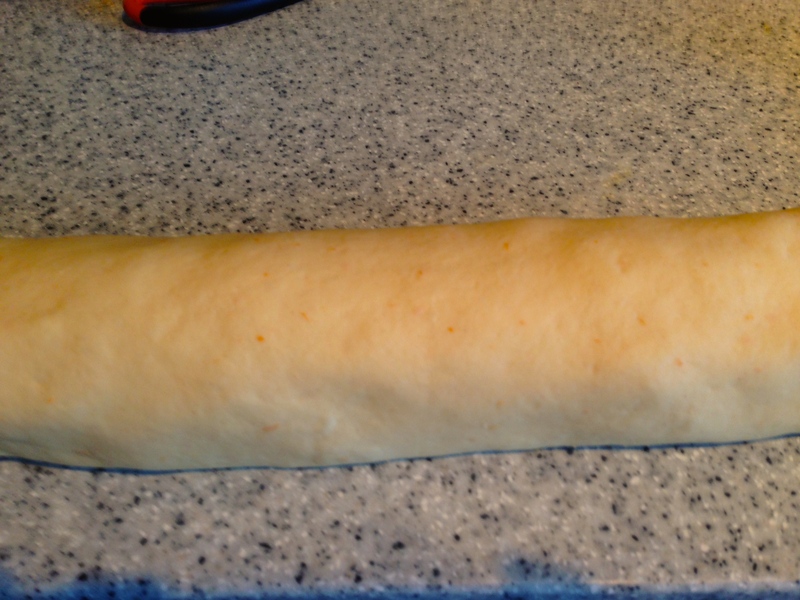 Roll the dough towards you into a cylinder using the tacked down edge to create a nice tight spiral. Cut off each of the ends of the roll, and then cut into 9 even slices. Place the buns cut side up on the baking tray leaving some space between each. Leave the buns to one side to rise for another 30 minutes. Heat your oven to 190C. Bake the buns for 25 minutes or until well risen and golden brown. Heat the marmalade with a teaspoon of water, sieve out the pieces and then lightly brush over the buns to glaze. Place the buns on a wire wrack to cool. Once the buns are cool, make the icing by combining the juice of 1 clementine with the icing sugar to a pourable consistency. Drizzle the icing over each of the buns. Unfortunately my house in India does not have an oven… I shall have to wait until Easter to try these… They sound a real treat and something to look forward to. Good idea, these would be great for Easter with dried fruits 🙂 we shall definitely eat them then!